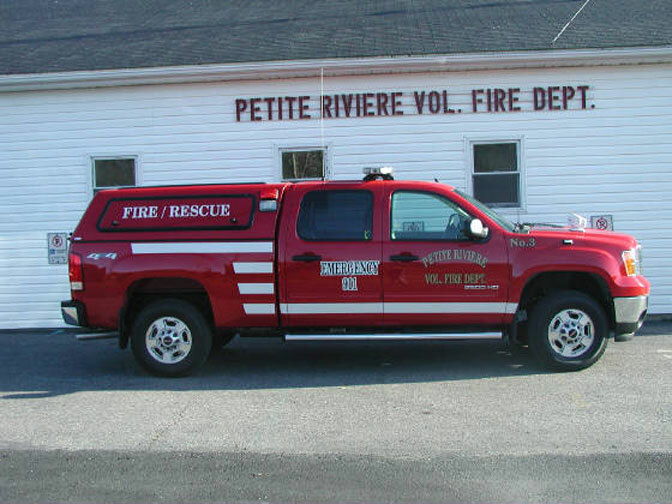 Information The Petite Riviere Volunteer Fire Department was founded in 1957 and has serviced the communities of Petite Riviere, Crousetown, and Green Bay Nova Scotia for over fifty years. There are approximately 35 volunteer members of Fire Department. In an effort to enhance training we have group mutual aid training sessions with Pleasantville Volunteer Fire Department, Conquerall Bank Fire Department and Lahave & District Fire Department. The Fire Department will also respond to First Response Medical calls. During the winter months, the Fire Department will also respond to ice rescues. Please check out our webpage for Petite Riviere Volunteer Fire Department Social Events. The Fire Hall can be rented for meetings, concerts, and wedding receptions. It has facilities which include a stage and sound system, bar and a full kitchen. The Fire Hall has a seating capacity of 276 with chairs only, 216 with tables and chairs or 173 with tables, chairs and a liquor license. For more information and hall rentals contact Bobby Croft at 902-688-2140. Meetings Practice training occurs on the 2nd and 4th Tuesday of every month. Fire fighters will simulate mock fire situations and drills. This is to ensure that when a real fire situation occurs, that all members of the Fire Department are ready, equipment trained and prepared to make every effort to save lives and extinguish the fire in a safe and effective manner.